Do you have a leaky roof? 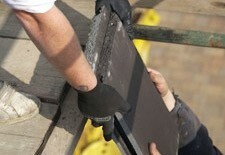 Perhaps you have an old crumbling chimney or your roof has been storm damaged? There's no need to panic - we have a team of professionals at hand to assist with whatever your needs are. Over our many years of serving customers across Leicester, we have built a reputation for high quality, offering amazing results and all at outstanding prices. From replacing missing tiles to offering a full re-roofing service, we are the people you need to speak to, so give us a call and let's talk over your requirements. Call us on 0116 316 9701 and we will come and give you a free estimate. Unlike many roofing contractors, we ensure you’re our top priority. The process is made simple and smooth, from initial assessment through to completing the job and giving you your guarantee. With us, everything is done to the highest standard, so call today. From small repair jobs to a full re-roof, we can help. We are local, so we can be with you in no time at all supplying you with a great range of solutions. Click below for areas we cover.